KELOWNA FREE PRESENTATION – IS POOR DIGESTION MAKING YOU SICK? IS POOR DIGESTION MAKING YOU SICK? What if foods like gluten and wheat aren’t the problem? Can you get rid of food sensitivities and digestive problems by changing HOW you eat, rather than what you eat? IS POOR DIGESTION MAKING YOU SICK? What if foods like gluten and wheat aren’t the problem? Can you get rid of food sensitivities and digestive problems by changing HOW you eat, rather than what you eat? Join the author of the acclaimed book You Are NOT What You Eat for this fascinating presentation, and see if you can return to fearless eating! 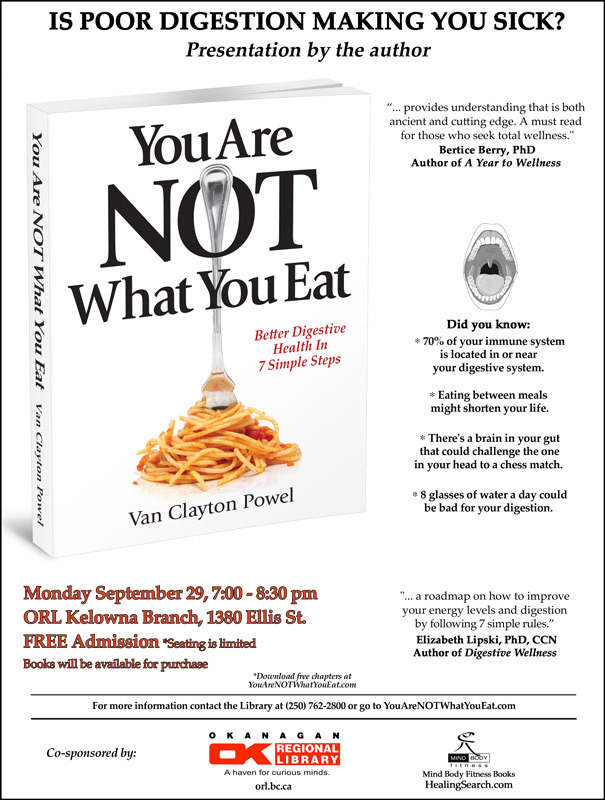 Author Van Clayton PowelPosted on September 16, 2014 Categories Blog, Digestion GuyTags digestive problems, food allergies, gluten free, kelowna library free event, Van Clayton Powel, wheat free, You Are NOT What You EatLeave a comment on KELOWNA FREE PRESENTATION – IS POOR DIGESTION MAKING YOU SICK?